While the Consumer Electronics Show in Las Vegas has been gradually integrating automobiles to their show for a few years, the North American International Auto Show has been looking to make the opposite swap to integrate more technology companies to the show. For the 2018 edition in Detroit, you will see displays from companies like Intel and Blackberry, among others. As the auto industry adapts to tech, new car buyers want to know how that tech will be integrated to make their lives easier. Autoshows have to adapt in kind. The auto show is expanding its awkwardly named Automobili-D showcase. Mobility tech will be on display from over 150 startups from every corner of the globe. While the showcase has traditionally been reserved for the industry-days of the show, it has now been extended into the first weekend of the public show, where it has been blended into a hiring event to provide Detroit tech workers more opportunities for employment. In the good old days, Detroit was the premier automotive tech innovator city. As the rest of the world caught up and passed Detroit in the tech sector, they’ve had decades of catch-up to play, and hopefully this auto show is a sign that Detroit is dropping its laggard ways in order to push its way back into the present. 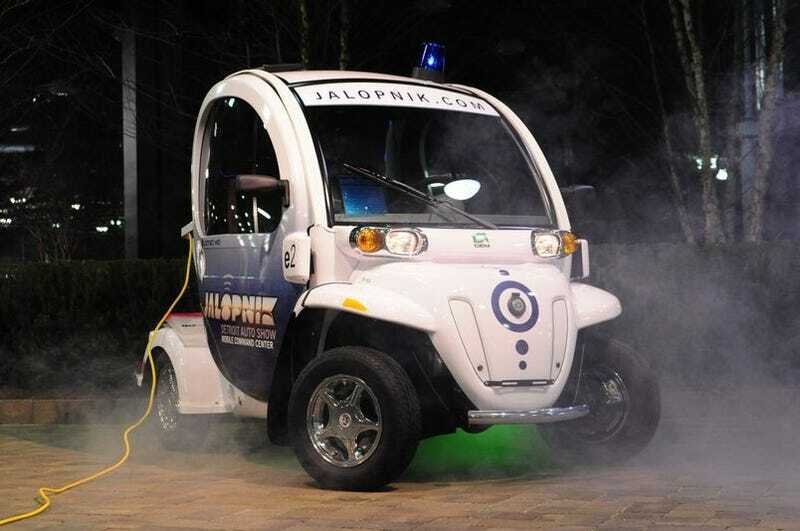 Of course, Jalopnik was on the bleeding edge of tech at the Detroit show all the way back in 2009 when we debuted the Jalopnik Mobile Command Center powered by GEM (above).